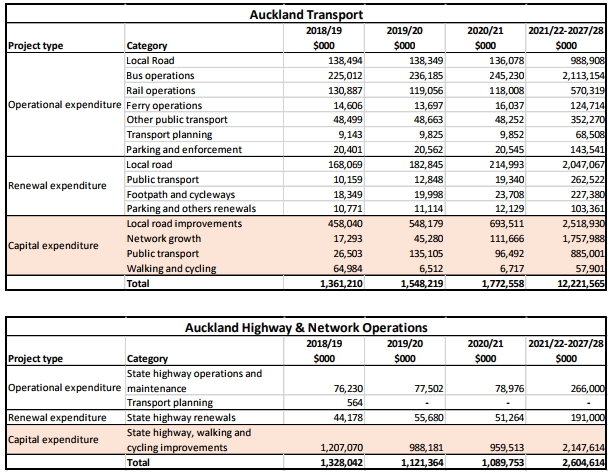 On Thursday we will see whether the Auckland Transport Board lives up to the promises of Chairman Lester Levy and radically changes the proposed 10 year transport budget from what staff have put in front of them. 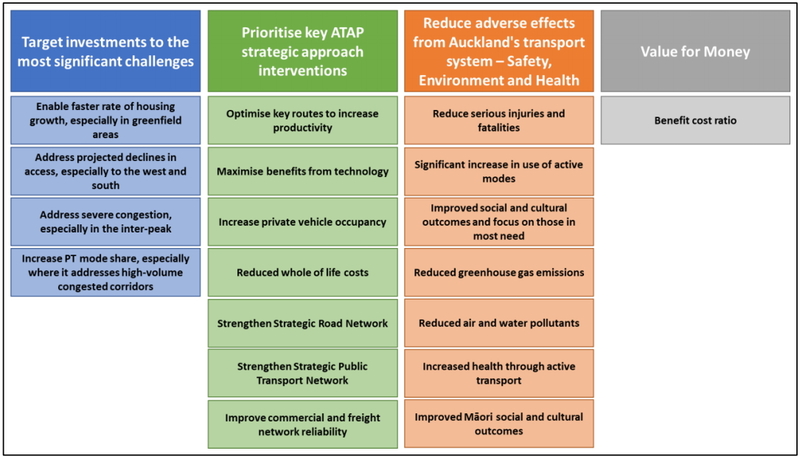 As I said on Friday, the bulk of the document is actually generally OK and provides a fairly compelling story about what needs to occur to improve Auckland’s transport system. However, it’s important to note that it is the story of what happens if the entire proposed transport programme was to be delivered. This is the programme that still has an unresolved $6 billion funding gap. While the proposed regional fuel tax goes some way towards filling this gap, it doesn’t close it fully, meaning that prioritisation becomes really important. Essentially there are committed and discretionary projects. Like the name suggests, the committed projects are ones which already agreed to be funded, such as projects which are carrying on from previous funding cycles. For example, the next batch of electric trains have already been committed to and funded by council so are included regardless. The discretionary projects end up being ranked, with only some of them ending up within the 10 year funding envelope. This is a decent process and is the same as what was used in the 2015 RLTP. What therefore becomes critically important is how the ranking process occurs, how do we go about assessing whether Project A is better than Project B? This is where a tool comes in that they call the “ITP calculator”. It uses a variety of criteria to seemingly measure a project’s value and these are shown below. The housing growth criteria is bizarrely weighted towards greenfield growth which seems to completely contradict the Council’s growth plans that push for most growth to occur in brownfield areas. This probably explains why some projects based around supporting sprawl rank surprisingly high? At this point the question of “weighting” becomes really important. We have four “challenges”, seven “ATAP strategic approach interventions”, seven “reduce adverse effects” and an overall cost-benefit analysis. Are these 19 elements all weighted equally as the accompanying text seems to suggest? Walking, cycling and safety should have been included in the first (blue) column to reflect paragraph 8 of ATAP, but for some reason this didn’t happen. Because of this mistake, the cycling programme likely scored poorly because it had no clear “problem” to score itself against. Because there is equal weighting, there’s enormous risk of double-counting across the different criteria. It’s pretty easy to see how something like Lincoln Road would have ticked a lot of boxes, even though it is an horrifically ugly and overblown roading project that will miss a huge opportunity to redevelop Lincoln Road as a more people friendly area. Because of the inexplicable priority given to supporting greenfield growth, these projects (normally roads) have ended up quite high up the list. Fortunately, it should be fairly quick and easy to fix up this mess. It seems the ITP calculator’s weightings just need be adjusted to reflect the direction of the Government and the Council more strongly, by more strongly weighting PT, walking and cycling. Given the importance of this prioritisation tool, it’s surprising that the RLTP doesn’t provide more detail about how it works and it’s also surprising there hasn’t been any public information on the tool made available. Do Councillors even know how it works and how different weightings might change project rankings? Does the Auckland Transport board even understand this process and how it inevitably led to last week’s mess? Where was the oversight in developing the tool? As I said last week, the real issue that the RLTP mess highlights is one of oversight and governance. Given the huge amount of transport planning progress that’s occurred over the past few years in Auckland and the strong political alignment between the Council and the Government, there should be mechanisms in place to stop parts of Auckland Transport from going rogue like they have so obviously done here. I certainly hope what comes out of this is a long and hard review of how this happened and some potentially big changes to ensure it doesn’t happen again. So once again, active transport modes we desperately need, are held hostage to some overblown and inscrutable “model” – which somehow acts as judge, jury and executioner without any rhyme or reason. “The ITP model made me do it”. This is no early draft released by mistake, by some low level staffer – as we are told. Its a cynical straw man exercise, designed to make the likely coming cuts in active mode funding seem more palatable. Because its not the original 90% figure. When in fact ANY cuts or even static funding for active modes is a major failure. They will try and spin it as a success if the funding stays the same. This makes me so angry. They are definitely gearing up for the bad news. Hope they hang Lester out to dry. No, because it then simply becomes pork barrel politics. There are only limited dollars available so they should be spent efficiently. This article highlights the problems with multi-criteria analysis which is effectively what AT is trying to do. – an approach to valuing travel time savings so that small delays have a lower unit value (the procedures now capture this I believe). Then put up all the projects on a dynamic webpage and allow the public to vary key parameter values, by say +-50%, to see how the project priorities change. Also allow the public to set the % spending bucket for each mode to see how it affects project priority. Their final settings can be part of their submission. Public companies aren’t run like this. If the shareholders and board want to push the company in a certain direction, the managers don’t ignore them based on some highly speculative numbers. Happy for economics to be used to eliminate bad projects, but as a means of ordering vastly different projects with vastly different outcomes you really need to know the full costs of many things that are very subjective. Im sure you’d get a better outcome from getting the top engineers around a table and discussing which projects meet the boards requirements. Obviously not the ones the analysis recommended. Future costs and benefits are discounted by the discount rate – this acts to reduce uncertainty in the numbers by putting less weight on future benefits and cost. A first year rate of return can be used to completely discount the future if so desired. The engineers/transport planners job is to provide the best prioritized list possible based on a technical assessment. Its then up to the public (via feedback), and government (local, NZ + NZTA) to make the final decisions. I note that private and public companies are run on highly speculative numbers (as no one can predict the future) – and that’s why some of them go bust. I expect this is an NZTA as well as probably a Local Government requirement. You mean there is a requirement to fudge some numbers and then re-fudge them if your board doesn’t like the outcome? Seems somewhat crazy. Blair, I do not have the faintest idea what you are talking about here: “protecting passengers from any rocks to guns to bombs to knife”. A mixture of amusing, bewildering, confusing, and downright off the wall. Still – carry on. PS – punctuation helps, sometimes. Just saying…. He’s a nutter, should have been banned months ago. Blair’s communication is unique, but his often interesting insights provide diversity. Oh, the tyranny of the neuro-typicals. How embarrassing for AT that our Minister of Transport announces he’s had a “sincere apology from AT chair Lester Levy”. I think that whilst Mr Levy know how to talk the talk, he’s too busy (eg: chair of three DHB’s) to effectively implement the changes required within AT. He resigned from all 3 DHB chair positions a few weeks ago, because he is now on the Ministerial Advisory Group on the Health System. But not to worry, he is also the chair of the Health Research Council, Auckland Transport, and environmental and engineering consultancy Tonkin + Taylor, a director of LLC Ltd and Mentum Ltd, Adjunct Professor of Leadership at the University of Auckland Business School, and Chief Executive of the New Zealand Leadership Institute. Might be time for AT to have a chair who can devote themselves full time to the role and who doesn’t have potential conflicts of interest. The supervisory role of chair seems more relevant after this little fiasco. Apologies on the one hand, and threats on the other are all very well but they don’t resolve the institutional chaos that AT currently projects. Does the RLTP get used for anything? Isn’t it just written because the Land Transport Act requires one is written? In the past the ARC used to knock them out regularly and everyone just ignored them. Unless of course there was a reference to someone’s favourite project, in which case they would quote the RLTP. One other factor is mode share/modal split. Although it is mentioned in the fine print, one of the key objectives of the RLTP should be actively moving to increase PT/reduce reliance on the private car. Stephen Joyce was very fond of saying that because 85% of Auckland travel was by car then that was an appropriate share of future investment in our transport system – rather than the approach of the old Regional Land Transport Committee (pre 2010) which was to allocate roughly a third to maintaining what we already have, a third to roading infrastructure and a third to PT and active modes – with the clearly stated intention of at least doubling PT usage over 20 years. It is not sufficient to passively react to increased PT usage – we need to be encouraging that trend by actively investing awards that end. It is about more than just the budget but about changing the language to reflect that goal. Well they are in the end beholden to Auckland Council and the Government. And they both have said they don’t like what’s been aired so far, so let’s hope the two Phil’s can sort it. I’m impressed – we have a Labour mayor and a (sort of) Labour Government and this is what happens. It’s going to be an interesting three years (or less). In October, the Board also approved the Transport Design Guide. I would have thought that approval of this guide was a clear directive to how funds should be allocated in the RLTP. 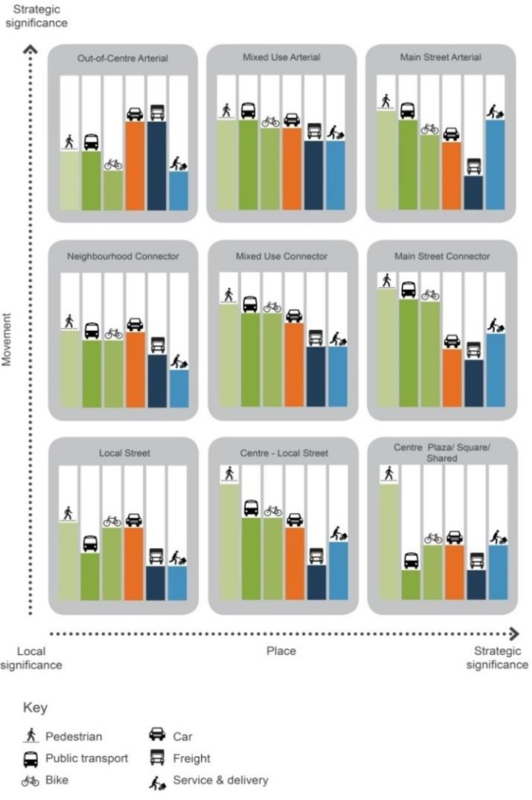 As an example in the TDG, walking has the highest modal priority in 8 of the 9 road and street typologies. To achieve an environment that reflects this priority will take a far higher share of the budget. This RLTP is therefore in defiance of the clear direction given by the board in approving the TDG. I understand that last year the AT Board signed off a comprehensive cycling plan that involved a significant increase in spending. It’s very difficult to understand how the Board can approve the Cycling plan and then it’s completely lost when budgets are assembled. I shudder to think what other dysfunction lurks. It’s easy to become desensitised to the real dollars and cents with such large budgets. Is “works that are not needed or wanted” a phrase from the Act Waiheke newsletter – seen it used a bit lately? Discovering the failure to weight objectives in the priority calculator is a great bit of investigative blogging – well done – and accounts for a lot. Yes this is the key thing. Not going to work if it’s not weighted in the calculator properly. The Supercity legislation forbids Auckland Council from “interfering” (any direct involvement) with AT and Rodney knew exactly what he was doing when he put that in! Auckland Transport also has a requirement in same legislation to take it’s strategic guidance from Auckland Council. There is nothing more strategic than funding decisions. It’s a CCO, and NOT an independent agency. Their money comes from ourselves via taxes and rates and we cannot vote who gets into the AT board or AT exec. So unless you are in favour of unelected bureaucrats spending our money then very much yes, they have to ultimately harken to what the mayor/council and govt want them to do. Everything else is a privatised society – at our financial and democratic cost.